One style you could go with this year is a more rustic look. The cool part about decorating this way is you can edge on scary or charming. If you are clever enough, I'm sure you could pull off both at the same time! 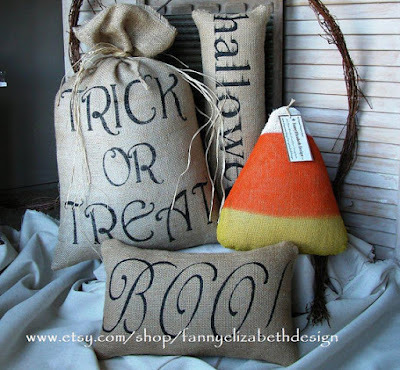 I've been eyeballing these Halloween burlap decor pillows for quite some time. They are very cute, but it just doesn't match anything in my home. These would be a great option if you are going to be throwing a party out in your shed or barn. There are lots of pillows on Etsy that will fill that void on your couch or chair! I enjoy how these burlap Halloween decorations look. I think it's great how the "Trick or Treat" pillow is actually a sack. The candy corn pillow is definitely my favorite out of this set. I wonder how comfortable these are to lay back on. Maybe a bit scratchy? 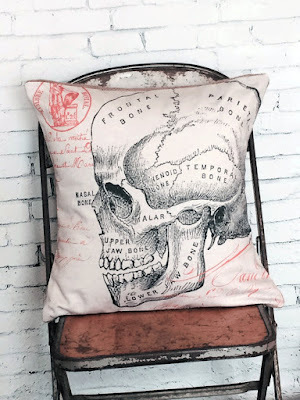 The designs in the skull almost melt into the background - that's why I love this sugar skull burlap pillow. It's very simple and elegant. Plus, you can have it out all year around and no one would question your sanity! 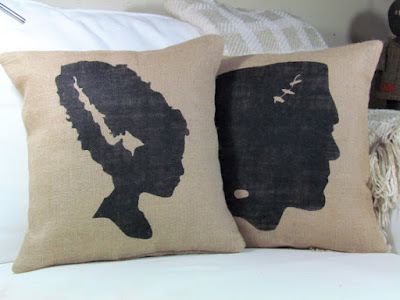 These Frankenstein silhouette burlap pillows are a classic. Even if you separated the two, we can all decipher who they are. It's truly a wonderful choice for Halloween. You could even give these as gifts to fellow monster lovers. 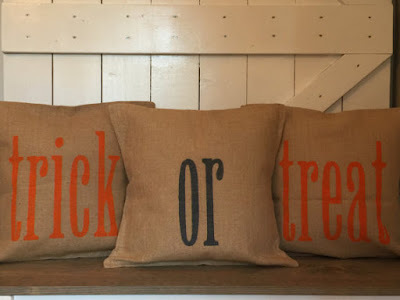 I'm not crazy about the font for these trick or treat burlap pillows. Other than that, I do like how it comes in a set of three. It makes decorating a large couch that much easier than a few mismatched pillows. 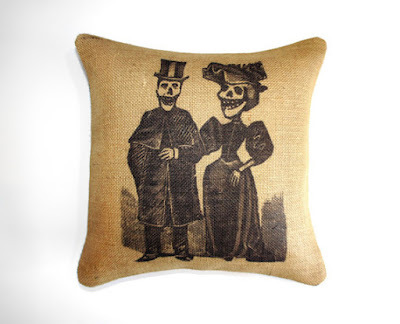 As much as I love El Dia de los Muertos, this skeleton couple pillow really disturbs me. Their evil grinning faces are just too unsettling for me! This would definitely add an eerie feeling to your home, if that's what you desire. 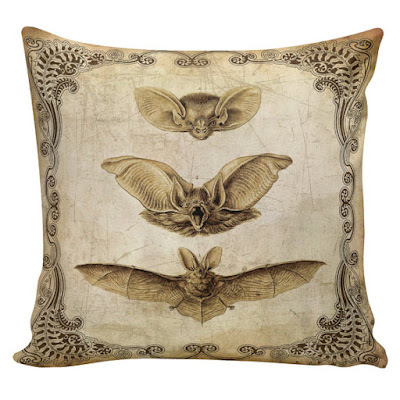 This bat burlap pillow cover looks like it came straight from a macabre biology book. The bat is divided up into different sections or behaviors. What I know for sure is that it looks like it's alive. What do you think? 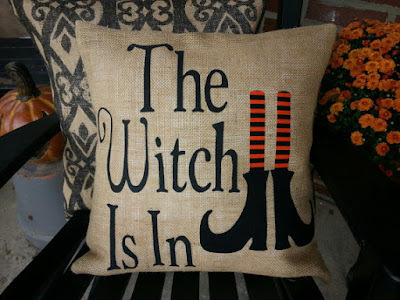 I can't help but fall in love with this "Witch Is In" Halloween burlap pillow. I have a bit of a witch obsession and the black and orange socks are hilarious. This vintage skull illustration is really cool! I definitely love how each part of the skull is labeled. This would be a great item to display if you wanted to have a mad scientist party or like a Frankenstein Halloween party. 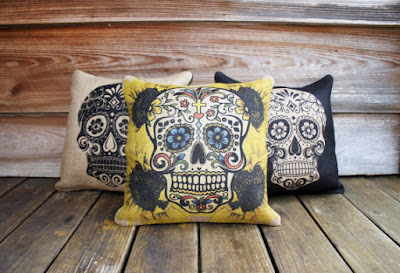 I do like you can buy a set of three of sugar skull pillows. For me, you can't just have one, especially if they are contrasting in color like these. 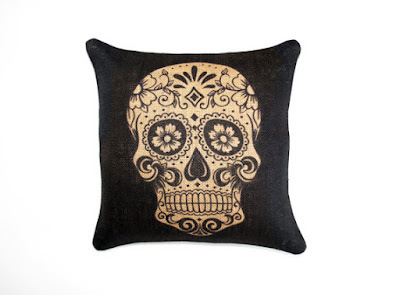 I don't think I like the yellow sugar skull burlap pillow. I would have rather seen it in red or blue. There are quite a few Halloween burlap pillows on Etsy. You should go browse and tell me which designs are your favorite! These are my top ten, what are yours? Comment below!